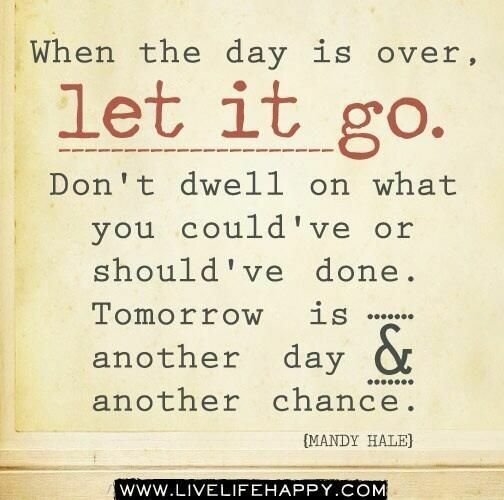 Let it go…. – Journey to my heart…. Just one of those days where I would like to start over….grateful every morning is a new start. Ready for tomorrow morning! I posted this about 2 pm. As I wrote it I realized I was going to choose to name what felt real for today and not keep hoping that at any moment the day would surprise me. 8 hours later it was just that kind of day. It wasn’t about not getting enough sleep, not getting enough exercise, not drinking enough water or about the weather. It just was a day where most things felt like a lot of work. It isn’t that I was especially crabby, although there were a few exchanges I wasn’t proud of. It isn’t that I didn’t smile or laugh, but the joy didn’t linger as long as other days. It was just one of those days! And so as this day draws to a close, I am thankful.that tomorrow is a new day. I am delighted that His mercies are new every morning! And I am choosing to Let it go…. Oh, what good counsel. LET IT GO. I am sure God lets it go once we have told Him how many times we have failed to reflect His face in our behaviour. Have a good TODAY!